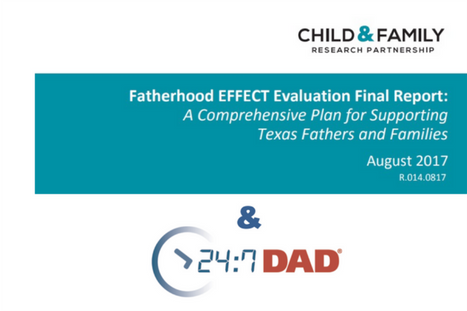 The Child and Family Research Partnership (CFRP) at the University of Texas at Austin just published a report on their independent evaluation of National Fatherhood Initiative’s 24/7 Dad® program that shows the positive impact of the program on reducing the risk of child abuse and neglect. How does it reduce the risk? It builds the protective factors that research shows reduce the risk of child abuse and neglect. This is the first evaluation of 24/7 Dad® to measure the program’s impact on this vital aspect of child well-being. The results of the evaluation are not only positive they’re downright stunning. When I first read the report, my jaw hit the floor. I had to read it several times to ensure I wasn’t seeing things. I’ll share these results in a series of three posts in this blog. This first post provides an overview of the results with more details to come in the subsequent posts. Those five protective factors are part of the Strengthening Families™ approach—championed by such national organizations as the Center for the Study of Social Policy (CSSP) and the National Family Support Network (NFSN)—that has swept across the country in recent years. More than 30 states have shifted policy and practice to help programs working with children and families focus on protective factors. States apply Strengthening Families™ in early childhood, child welfare, child abuse prevention, and other child and family serving systems. As a result, hundreds of direct-service providers across the country focused on the prevention of child abuse and neglect have adopted the approach as the foundation of their work. Since March of 2016, National Fatherhood Initiative (NFI) has educated state agencies and direct-service providers on how to effectively work with dads to build the protective factors. NFI has partnered with CSSP, NFSN, and state networks of family resource centers (FRCs) to educate state agencies and direct-service providers by publishing a white paper, this brief, and this ebook. We have also conducted free webinars on behalf of NFSN and state networks of FRCs to further educate direct-service providers. Four direct-service providers that operate in different regions of the state have contracted with PEI to implement the Fatherhood EFFECT program. Three of the providers chose 24/7 Dad® as their evidence-based fatherhood program: BCFS Health and Human Services (sites in South Texas/Gulf Coast and West Texas), the Child Crisis Center of El Paso (site in Far West Texas), and Catholic Charities of the Archdiocese of Galveston-Houston (site in East Texas/Gulf Coast). The evaluation conducted by CFRP focused on the BCFS and Child Crisis Center sites because too few dads had completed the fatherhood programs at the other two sites at the time of the evaluation. CFRP conducted a comprehensive evaluation that consisted of quantitative and qualitative research methods. The quantitative methods centered on the use of two questionnaires. The Protective Factors Survey (PFS) measured the impact of 24/7 Dad® on building the five protective factors in dads. The 24/7 Dad® A.M. Fathering Survey (FSS) measured the impact of the program on building pro-fathering attitudes, knowledge, and self-efficacy (in fathering and parenting skills) and, thus, the five characteristics of the 24/7 Dad: Self-Awareness, Caring for Self, Fathering Skills, Parenting Skills, and Relationship Skills. Highly significant increases in four of the five protective factors: Family Functioning/Resiliency, Social Support, Child Development/Knowledge of Parenting, Nurturing and Attachment. Although the measure of Concrete Support did not reach statistical significance, the dads improved in this factor nonetheless. Highly significant increases in all five characteristics of the 24/7 Dad. The large sample sizes—the largest ever included in an evaluation of the program—that lend credibility to the results. The increases in the protective factors at the “statistically highly significant level” (p<.001). Statistically speaking, this means the results have less than a one in a thousand chance of being wrong. The increases in the five pro-fathering characteristics of the 24/7 Dad also at the “statistically highly significant level” (p<.001). As CFRP notes in the report, these results are consistent with the evidence-base for the program. Moreover, the results continue to support the effectiveness of the program for all dads regardless of such factors as race/ethnicity, marital status, and education. The results also continue to support its effectiveness with dads who live in different parts of a state (e.g. region, urban, and rural). I look forward to sharing more details from this evaluation in the posts to come. One of those details includes a unique aspect of this evaluation of 24/7 Dad®: another measure we’ve often been asked about but that hasn’t been part of an evaluation of the program. If you can’t wait another two weeks for me to provide those details, I encourage you to download the report and read it right away. (Pay particular attention to Chapter 3 as it includes most of the details on the evaluation of 24/7 Dad®.) The additional results of this comprehensive evaluation will undoubtedly help you improve your work with dads, even if you don’t use 24/7 Dad®. I want to extend a “Big Thank You” to the staffs of BCFS, the Child Crisis Center, and Catholic Charities for their tireless work to serve dads and families with the 24/7 Dad® program, and also to the CFRP staff for keeping NFI informed during the past two years on the progress of the evaluation. Does your organization need a fatherhood program shown to build the protective factors that reduce the risk of child abuse and neglect? What funders could you approach—private and public—with a focus on preventing child abuse and neglect that would fund your organization to start or expand 24/7 Dad®?